On December 1, 2014, Russia's Gazprom and Turkey's Botas signed an oil and gas memorandum of understanding marking the launch of the Turkish Stream gas pipeline. The project is set to be launched in December 2016. The natural gas pipeline, a 1,090 kilometer long (677 mile) will run from Russia to Turkey, via the Black Sea. A first draft of legally binding documents is expected to be signed by the end of June, at the latest. The Turkish Stream gas pipeline project will be implemented on time, regardless of the new US law that expands sanctions against Moscow, Russian Energy Minister Alexander Novak said Friday. 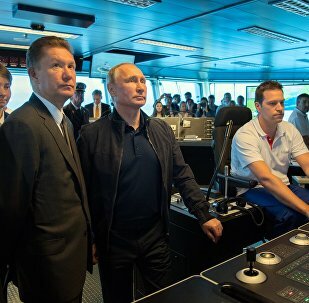 Russia's energy giant Gazprom has launched the construction of the second string of the Turkish Stream gas pipeline in the Black Sea, local media reported Wednesday, citing official sources. The Russian president informed his Turkish counterpart of the beginning of the pipe-laying work at the Turkish Stream pipeline's deep-water section. Vladimir Putin also said he hoped it would be possible to meet the construction deadlines for the Akkuyu nuclear power plant. Russian President Vladimir Putin has signed a law on the ratification of the agreement with Ankara on the Turkish Stream gas pipeline. Turkish lawmakers ratified the agreement with Russia on the construction of the Turkish Stream natural gas pipeline, a RIA Novosti correspondent reported on Friday. Ankara does not see any obstacles for the implementation of the Turkish Stream project, the country's energy minister said. Moscow will consider extending the Turkish Stream pipeline into the European Union only after receiving official guarantees. 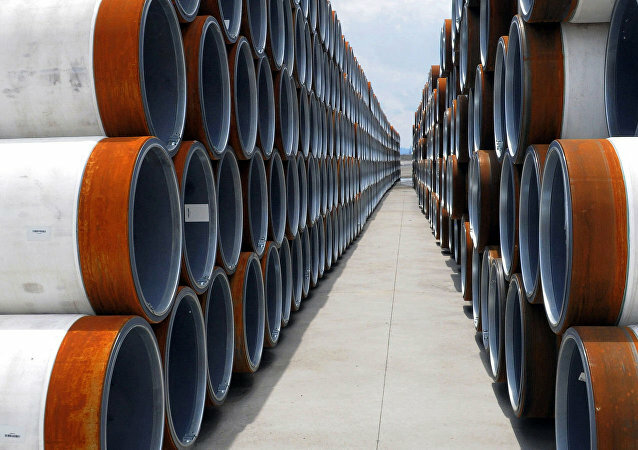 Athens supports the Turkish Stream gas pipeline as it will enhance the energy security in the country and help Greece reach its aim of becoming a regional energy hub, a spokesperson for the Greek Ministry of Environment and Energy told Sputnik. On Monday, Russian President Vladimir Putin met with his Turkish counterpart Recep Tayyip Erdogan for the third time in barely two months. According to Norwegian newspaper Aftenposten, the increasingly warm "flirtation" between the two presidents is a cause for alarm in both Washington and Brussels. The European Commission, which stands for the continuation of Russian gas transit to Europe via Ukraine after 2019, has not completely ruled out a possibility to receive gas from Russia via the Turkish Stream gas pipeline, European Commission Vice President for Energy Union Maros Sefcovic said Wednesday. Pipe-laying work for the Turkish Stream gas pipeline will begin in 2017 and end in late 2019, Russian Minister of Energy Alexander Novak said Wednesday. 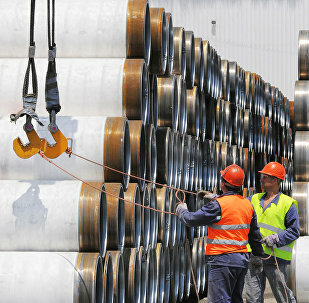 Turkish Stream gas pipeline construction will start in 2018, the Gazprom chief said. Russia and Turkey have agreed to simultaneously launch both legs of the Turkish Stream gas pipeline on December 30, 2019, within the framework of an intergovernmental agreement, the Kommersant newspaper reported Tuesday citing the document. The Gazprom energy giant received the first permits from Ankara to build the offshore section of the Turkish Stream gas pipeline. The Russian president said Moscow hoped the Turkish Stream pipeline project would be eventually implemented. The Turkish top diplomat said Ankara could ink additional agreements with Moscow concerning the revived Turkish Stream gas pipeline project. The agreement on the Turkish Stream gas pipeline project envisions the construction of one pipeline leg by late 2019, with a possible expansion to two, Russian Energy Minister Alexander Novak said Tuesday.